Last night, the president of these United States tweeted at Jimmy Fallon, suggesting that the Tonight Show host needs to “be a man.” Fallon soon responded by saying he will donate to RAICES in Donald Trump’s name. What an insane, terrible time to be a late-night host/person. 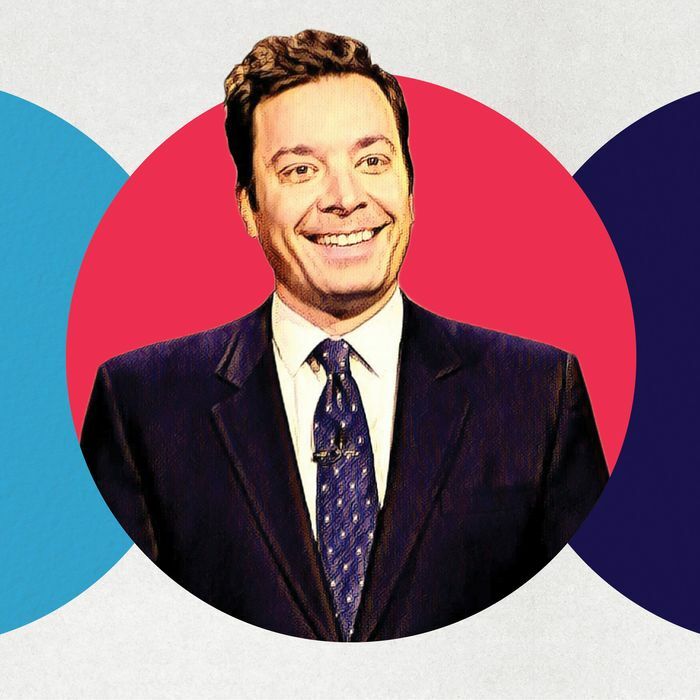 Tonight Fallon will likely do what he’s done since inauguration — tell a few jokes about Trump and then move on — because to Jimmy Fallon, it’s not about Jimmy Fallon. (Its an instinct that has led him to use correspondents in his monologues who have a more vital connection to a given news item.) No, Fallon thinks of himself almost like he’s in the service industry. As he’s said since he was hosting Late Night, he just wants to give his audience one good laugh after a hard day so they can go to bed with a smile on their face. And he’ll do whatever he thinks might achieve that, be it impressions, songs, sketches, a few monologue jokes about the day’s news, or just spending eight minutes playing silly songs with the Roots. “Do Not Play” is the subject of this week’s episode of Good One, Vulture Comedy’s podcast about jokes and the people who write them. (Note: The interview was conducted before any of the recent back-and-forth with Trump.) Listen to the episode and read an excerpt of the discussion below. Tune in to Good One every Monday on Apple Podcasts, Spotify, or wherever you get your podcasts. After doing “Do Not Read” for years, in October 2012 you do “Do Not Play.” Do you remember how that revolution happened to try it with songs? We were trying to see if there were any other things we could do with “Do Not.” When you are doing a late-night show, you are really just looking for things that can fill time and make you laugh, so we’ll try anything at least three times until eventually we retire it. We go, “Well we tried that, that one clearly didn’t work.” There’s so many bad bits that we’ve done. Can you walk me through the process of how it gets on air? Yeah, so we do one every three months. Basically, our writer Patrick Borelli, who has been with us for a long time, has an email set up where if our viewers hear something that they think should be on this list they can send it to us. And he listens to all that stuff. Also, he’s got some weird friends that just know and it’s word of mouth. So he’ll come into my office with like a stack of 30 fake vinyl printouts (the real vinyls don’t exist anymore) so we can look and see who the artist is first. Usually they look fantastic — they look like this should be a normal, totally great song. Then we just sit around and listen to them on a computer in my office that’s connected to my TV. Whichever one makes us laugh. What is the role of a bit like this? It’s not what people think of late-night shows now. It’s not like a viral thing or big recurring feature. What is the value of having things like this? I’m not out for the next song to go viral, like, “Oh wait till you hear ‘Moustache.’” I do it just for fun and just to keep the brain thinking differently and going, “Oh my gosh, that was so good” or “Oof, that was a bad one.” It’s good for me and it’s good for the Roots. It wakes us all up too because it makes it fun. We’re still definitely having fun doing this job, but these are the little things that just make us laugh. I’m looking forward to it. I think we’re doing one tomorrow. Conan’s about to move to a half-hour format, but there were some rumors of him possibly moving to weekly. Why does five nights a week work for you? When I was growing up, it was always good to have Johnny Carson there or Conan O’Brien there for you. At the end of the day, you go, “[Exhale] I know Conan is gonna be on and it’s going to be funny.” I think it’s important just for America to have something you can watch, whether it be the Tonight Show or Colbert or Kimmel or whatever it is. You can just go, “That’s the news. That’s the joke about it. Now I can dream now.” I think it’s important. For me, I don’t know what I would be doing if I didn’t have this job. In an interview you said it’s not the Jimmy Fallon show, it’s the Tonight Show. What is the difference? Why do you prefer about it being the Tonight Show? ﻿All the people down the line that work on the show that worked with Leno — some worked with Carson — there’s a history to it that you have to respect there. I feel that. I respect the name “The Tonight Show.” It’s different than calling it “The Jimmy Fallon Show,” which would probably be on the internet. It probably wouldn’t be on television. The Tonight Show — just calling it a show is an old-fashioned-y thing. No one calls their show “it’s the ‘blank’ show” anymore. It’s old-fashioned. There’s something I like about it. That’s why it’s been around for so long. People have seen it and copied it and done their version. Not of my show, but of Johnny Carson, who inspired Letterman, who inspired Conan. Everyone inspires each other, but this is the first and this is the pinnacle. We have people on the show now that are like, “Dude, I’m on the Tonight Show.” I’m like, “You just won a gold medal!” “I know that but I won that to get this. My mom is here. She’s so excited. I made it. I’m on the Tonight Show.” It’s part of the culture. You joined SNL 20 years ago. You’ve been doing late night almost ten years. Johnny Carson retired at 66, Jay at 64, you are currently 43. Could you do this for another 20 years, and what would the show even be at that point? What could you do for 20 years? I didn’t think I could do anything for 20 years. People got to watch me grow up on television literally. I was 23. I have kids now, I’m married now. I don’t laugh in all my sketches now — 78 percent. Most sketches. The ones that are funny, that’s the ones I laugh at. But yeah, as long as people are watching. I don’t know what it is, but I have something in me that doesn’t stop. If I want to do something, I’ll find a way to do that. Now I’m here. I knew when I started Late Night, if things went well, you get the Tonight Show. But you do that and it’s a pope job — you do that until you’re mumbling into the microphone. That’ll be the way it is until maybe television ends. Though, I think shows like the Tonight Show and the Today show and sports will always be good for television. News shows as well. You need to catch up in the world. The other ones can live on Netflix and those things. But there’s always going to be a need for topical comedy. There’s always going to be something you want to look forward to at the end of your day, whether it be Colbert or Kimmel or Conan or whoever makes you laugh and go, “Ugh, I love this show because it makes me laugh and I just forget about everything and I just go, ‘Thank you, that’s what I need.’” There’s room for all of that. I’ll be around as long as you’ll have me.